The Public Web Docket Sheets option provides access to search, view and print the docket sheets for Pennsylvania’s Appellate Courts, Criminal Courts of Common Pleas, Magisterial District Courts and the Philadelphia Municipal Court. In addition, a Court Summary Information report is available for Criminal Courts of Common Pleas and Philadelphia Municipal Court cases. The Secure Web Docket Sheet option provides access to search, view and print docket sheets that contain additional content not accessible for public viewing, for Pennsylvania’s Criminal Courts of Common Pleas, Magisterial District Courts and the Philadelphia Municipal Court. In addition, secure Court Summary Information, Case Accounting and Pre-Sentence Summary reports are available for Criminal Courts of Common Pleas and Philadelphia Municipal Court cases. A secure login is required to access this service. 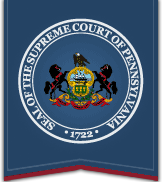 Complete listing of Pennsylvania judicial districts and county numbers. Note: A party to a case, or the party's attorney, who wishes to correct a data error on a web docket sheet should submit a request form to the court in which the case was filed. For further information, please reference Section 6.00 of the Electronic Case Record Public Access Policy of the Unified Judicial System of Pennsylvania, located on the Public Records page. The Public Calendar Schedule option provides access to search, view and print case events scheduled in the Criminal Courts of Common Pleas and Magisterial District Courts. This feature is useful to find when and where a case event will be heard without having to call or visit the courthouse. The Secure Calendar Schedule option provides access to search, view and print case events scheduled in the Criminal Courts of Common Pleas and Magisterial District Courts. The secure version provides additional search options, not available to the public, to find case scheduling information. The secure calendar schedule also lists all case participants and whether attendance at the case event is required. A secure login is required to access this service. Finding public court information is easier than ever with the launch of PAeDocket - a free app that provides a quick and simple search of court cases or dockets. Users can search by case number, participant name, organization name, offense tracking number, police incident or complaint number or state ID number. To download the application, visit the app store and search for "PAeDocket".